One of the most frequently asked questions I have gotten since Noa’s birth, is how Adina has adjusted to being a big sister. Truthfully, I had a lot of concerns about how the transition would be for her. 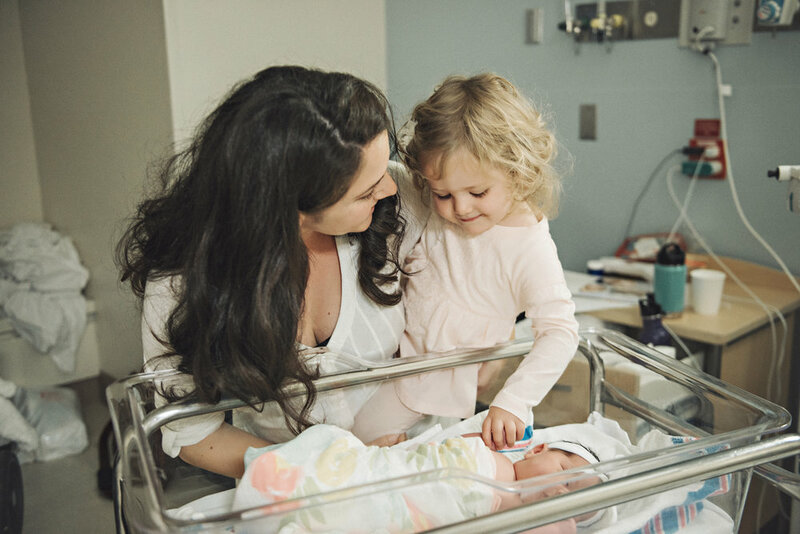 Not only is she our firstborn, but Adina is also the first grandchild on both sides of the family and was used to having all of the attention on her for the first two years of her life. 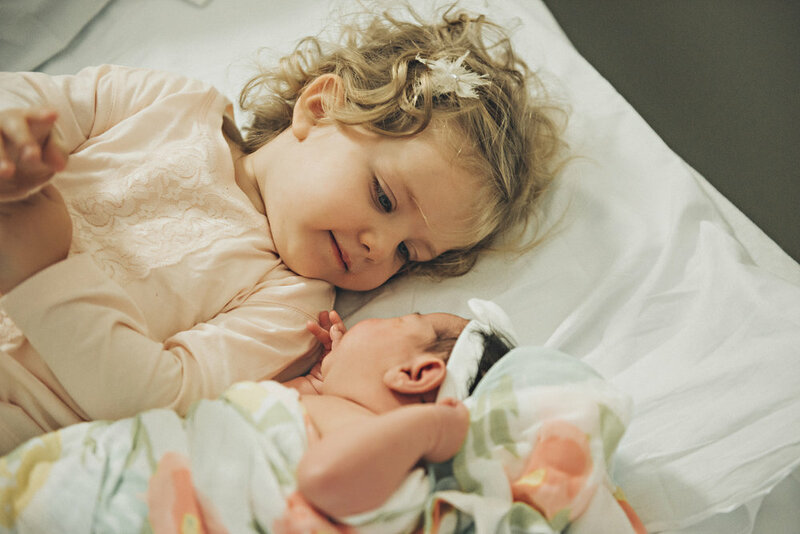 So naturally, I was worried that once the new baby arrived, there could be some feelings of jealousy or even animosity directed towards her new sister. Now that Noa is over two months old, I can say confidently that the transition for Adina (and really for our whole family) has been so smooth and better than I ever imagined! 1. We started introducing Adina to the concept that her baby sister was growing inside of mommy‘s belly and she understood to whatever extent a one and a half-year-old could. When I had doctor appointments, I would tell her I was going to check on the baby. She would point to my belly and say “baby sister” and give me kisses on my baby bump. It was seriously the sweetest thing! Daniel Tiger - The Baby Is Here! 3. Many people also told me about the Daniel Tiger episodes in season five about welcoming his baby sister. We watched those episodes together, along with reading the book. Adina now adores the characters on the show and especially loves when Baby Margaret (Daniel’s sister) is born. 4. Lastly, we bought and received some special “big sister” gifts for Adina to play with. She already had a few baby dolls (and we added even more to the collection - she has 4 or 5 in total) so we got some new accessories for them. We got a baby doll Ergo carrier, a baby doll stroller, a baby doll cradle, and a baby doll high chair that came with a bib, baby bottle, and eating accessories. Adina loves to copy whatever I do and gravitated towards these toys on her own. It’s so cute when I see her pushing her dolls in the stroller and feeding them bottles. I melt whenever she puts her doll in the mini baby carrier! 5. We also thought through how we wanted Adina to meet Noa for the first time. 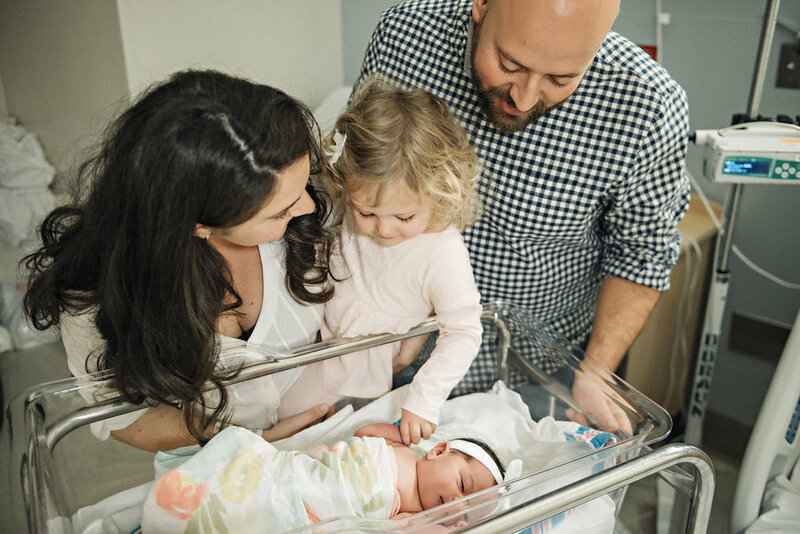 I considered just waiting until I came home from the hospital, but since we only live a block away from the hospital, we decided to have my sister bring Adina there to meet us the day after I gave birth. When Adina first arrived at the hospital, she was not in a good mood. It was right after her nap, and she was still kind of tired. Plus all of the beeping and strange people in the hospital made her a bit upset. When my sister brought her to the labor and delivery floor she started to cry when they got out of the elevator and was refusing to come out of her stroller. I had such high expectations for their first meeting, that I was devastated it was not going to go as planned. I decided to collect myself and go with the flow. I left Noa in my room and went out in the hallway to comfort Adina. After a few minutes she calmed down and was ready to come in. She was still cautious and wanted to stay in her stroller so we just rolled with it and brought the baby over to her instead of the other way around. She was immediately mesmerized and wanted to hold her. At that point, we also had some gifts that we gave her “from Noa,” including a big sister book, a big sister crown, and a big sister doll. She was not as excited about the gifts as I thought she would be, because she was so overstimulated with everything else going on. But once we got back home, she put on the crown and carried around her doll the rest of the week. We arranged to have our family photographer come to the hospital to do a Fresh 48 shoot, photos taken within the first 48 hours of birth. Michael was very skeptical about this and pushed back when I told him I wanted to do it, since we were planning to have a newborn shoot a few weeks later, once we got back home. But I am so happy we decided to do it, because she was able to capture the moment that these girls met each other for the first time in the most beautiful way. I am so grateful that we have these pictures to document this special moment. Since we’ve been home, we have included Adina as much as possible in all things with the baby. In the first few weeks home, we explained that we had to be gentle with Noa and modeled how to hold her and comfort her. We have tried to empower her by allowing her to help us with things like getting diapers and wipes ready for diaper changes or passing us the pacifier when she is crying. There have only been a couple of times that Adina has seemed somewhat jealous, but she never directs her frustration or acts out toward Noa. There have been times where I was nursing Noa, and Adina asked me to pick her up at the same time, which obviously I cannot. It does hurt my heart a little bit in those rare moments because I want to give myself fully to both girls, but we have adjusted and most of the time she is happy and head over heels around her sister. Even when Adina is crying or throwing a tantrum, the second we bring her over to Noa, she instantly calms down. When Noa is crying, Adina immediately says “it’s okay, Noa” and goes over to rub her leg or her head. She is so sweet with her – she even has her own “baby voice” that she uses when she speaks to Noa. From the minute she met her, it’s pretty much been love at first sight. I was worried about how Adina would adapt to having a little baby around and having to share our attention, but she has just loved her from the minute she met her. 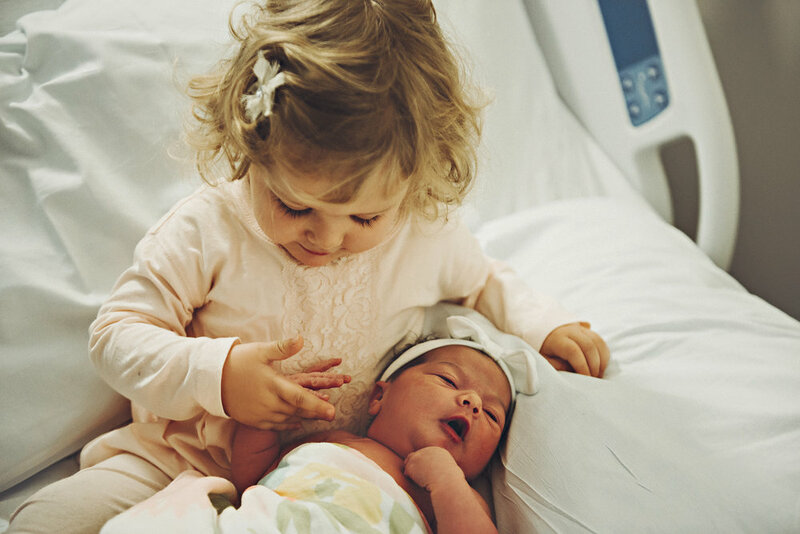 It’s like she had been waiting all this time to be a big sister. My hope for them is that they grow even closer and stay best friends for life. This post contains affiliate links, which means that at no additional cost to you, I may get a small commission if you purchase a product using a link in this post. Thank you for supporting my blog!